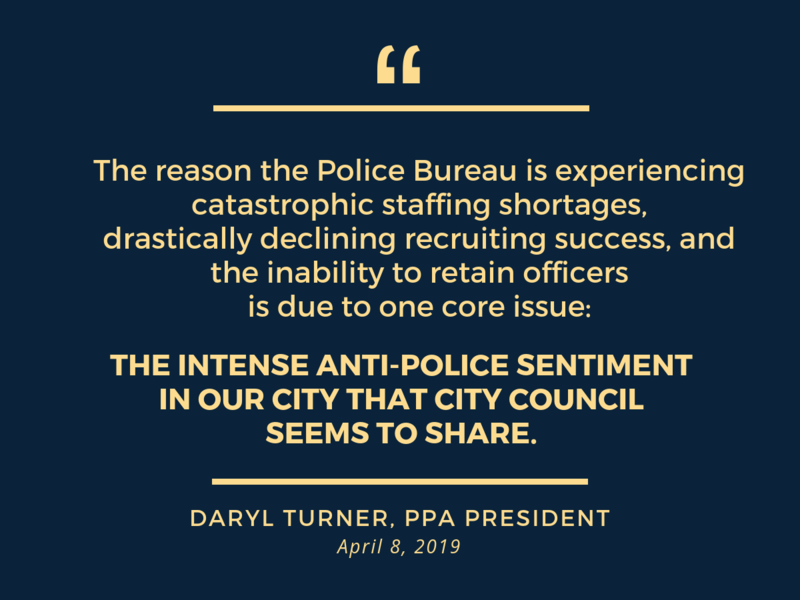 Last week, Chief Outlaw and her staff sat in front of the Portland City Council during budget hearings and tried to explain why recruiting and retaining police officers has become a catastrophic problem for the Portland Police Bureau. At one point Chief Outlaw pointed out the elephant in the room: applicants would rather work at other police agencies for more or equal wages than deal with working under a microscope in a highly politicized city where police officers are vilified. This notion, of course, seemed to go right over the Commissioners’ heads. Recently many articles have been written about the law enforcement recruiting and retention crisis across our country. On Friday for example, a local news station wrote about how such things like the dangers of the job, the high bar for entry into the field, the lack of recruiting budgets, and low unemployment rates in other sectors are hurting our efforts to bring on the next generation of police officers. While those may be major obstacles in other parts of the country and in other Oregon agencies, those aren’t the reasons why PPB is facing a recruiting and retention crisis. The reason the Police Bureau is experiencing catastrophic staffing shortages, drastically declining recruiting success, and the inability to retain officers is due to one core issue: the intense anti-police sentiment in our City that City Council seems to share. The result of that problem is that policing in Portland is hideously unattractive, discouraging good applicants from applying and prompting our officers to leave or retire as soon as they’re able. Every day we can see the results of the anemic staffing levels and how it impacts the communities we serve. Residents and business owners are up in arms, not because the men and women who serve their communities aren’t doing their jobs, but because they know City Hall has put a stranglehold on proactive policing and enforcement and has been completely unsupportive of PPB and its officers. For example, Mayor Wheeler is quick to praise the work done by police officers until controversy stares him in the face. In recent weeks, he’s acknowledged that failure and promises to be more supportive in the future. It’s imperative that his actions reflect his words. And it’s imperative that the rest of City Council does the same. False narratives, knee jerk political reactions, along with personal and political agendas have created a hostile work environment and made it an impossible task to effectively police in the City of Portland. Our police officers are frustrated. They deserve better. They deserve to work in an environment where they can perform their primary function — keeping our communities safe — with the support of City Hall. Similarly, our communities are frustrated. They deserve better. They deserve safe, clean streets. It’s that simple. Our elected officials need to prioritize basic city services, the most basic of which is public safety and livability. They can start by doing three things: improving the livability of our drastically deteriorating neighborhoods; supporting the incredible work our officers do to keep our communities safe; and having enough police officers to satisfy our communities’ public safety needs.